As this is the first book in the series, the sentences are short and simple. Readability is leveled for nonreaders. Text repetition helps nonreaders learn how to read. Activities sections are common in children's books for the Korean market. These activties are designed to promote letter recognition in nonreaders. "Meet My Family" is the first book in a series for emerging and nonreaders. 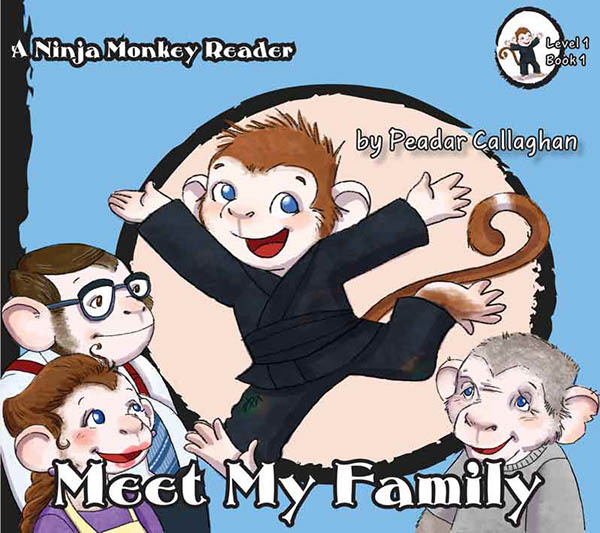 The books follow Ninja Monkey as he explores his world and gets into trouble. Display text is set in Roman Holiday. Story text is set in Tucker Script.